Balanced teamwork creates the the perfect team - The student, the teacher and the parent. What ages to you teach? I teach children as young as 3 years old, all the way to adults to 93, beginning through advanced levels. I am one of the few teachers that is experienced with teaching piano lessons to three-year-olds. I am also experienced with teaching advanced repertoire, and work with many elementary school, middle school, high school, and retired individuals. I teach both competition-level piano students as well as non-competitive piano students. Wenjen piano studios only offers private piano lessons in order to promote growth of each student at his/her own pace. Groups lessons limits the pace of instructions to the average or least advanced student in the group. Is it okay if I have an electric piano to practice on at home? No, it is required to have an acoustic, non-electric piano to practice on at home. It can be an upright, baby grand, or grand piano. There is big difference in the touch and weight of the keys of an acoustic piano and electric piano, even if the keys of the electric piano are "weighted." The is especially significant while working with very young children. 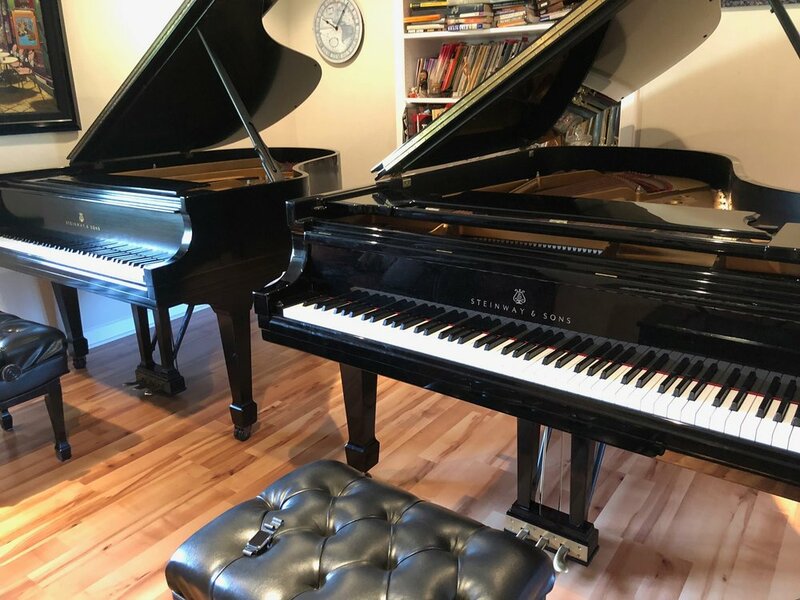 It is frustrating for the children to practice at home, and then play on the grand piano at piano lessons, unable to produce sound on a heavier action piano. Yes! Most of my students begin piano with me at a young age with no previous instruction. I now how a large amount of advanced piano students, but most began their first piano lessons with me many years ago. What is different about your piano studios? I am one of the few piano studios in the South Bay and Orange County that offers monthly performance workshops for ALL students. This requires more time commitment on my part, as well as for the students, but it really is the key to the success of my piano students. My students all tell me that they love performing in the monthly performance workshops! I believe that the workshops provide a social aspect to what is otherwise individual activity. Who would want to go to soccer practice each week without playing in the soccer games? The workshops feel more like "piano parties," as coined by my students, with the formalities of a recital, practicing public speech by announcing, practice awards, followed by a reception to satisfy any sweet tooth. The monthly workshops give each student a deadline to memorize one or two pieces, and give them each their own motivation to practice and achieve. The cost of the the workshops is included in the monthly fees. Do your students play in competitions and other events? About 35% of my piano students participate regularly in piano competitions such as the SYMF, the Southern California Jr. Bach Festival, the MTACLB Sonata/Sonatina and CAPMT MTACLB Sonata/Sonatina Competitions, Royal Conservatory Certificate Program (kindergarten and older), National Guild Auditions (even the 3-year-olds and adults!) and students around 2nd grade and older enroll in the Certificate of Merit Program. Students may also participate in the Royal Conservatory Music Development Program, CAPMT Piano Auditions and CAPMT Ensemble Auditions. Advanced students may also participate in the CAPMT competitions and MTNA national competitions. All students participate in the monthly performance workshops and June recital. Do you travel to homes to teach piano students? No, I do not travel to students' homes to teach. I keep a very full piano studio with over 30 piano students and teach each student back to back Mondays through Thursdays at either the Torrance or Seal Beach studios. Students have all lessons at my piano studios and must be willing to perform in the monthly performance workshops held alternately in Torrance or Seal Beach each month. I am experienced in teaching students with a variety of special needs, including students that are blind, deaf with minimal hearing, and students diagnosed with ADHD and dyslexia. I have also taught a large number of gifted and highly gifted, and profoundly gifted students, which also requires specialized teaching. Please fill out the EMAIL INQUIRY AND WAIT LIST FORM if you have interest in becoming a student. Submitting the email inquiry will automatically put you on my wait list, or I will contact you immediately if there is an open lesson time for the day and time that you have indicated.